This is the seventh of eleven Letters of Euler I will rewrite and post on the subject of infinitesimals (the infinitely small), an idea that is fundamental to a good understanding of calculus. Click here to read the previous letter. Principle of the satisfying Reason, the strongest Support of the Monadists. The system of monads is established in the former case, since after having divided a body into indivisible particles, these very particles are monads, and there would be reason for saying that all bodies are composed of them, and each of a certain determinate number. Whoever denies the system of monads, must likewise, then, deny that the divisibility of bodies is limited. he is under the necessity of maintaining, that it is always possible to carry this divisibility further, without ever being obliged to stop; and this is the case of divisibility in infinitum, on which system we absolutely deny the existence of ultimate particles: consequently the difficulties resulting from their infinite number fall to the ground themselves. In denying monads, it is impossible to talk any longer of ultimate particles, and still less of the number of them which enters into the composition of each body. You must have remarked, that what I have hitherto produced in support of the system of monads is destitute of solidity. I now proceed to inform you that its supporters rest their cause chiefly on the great principle of the sufficient reason, which they know how to employ so dexterously, that by means of it they are in a condition to demonstrate whatever suits their purpose, and to demolish whatever makes against them. The blessed discovery made, then, is this, “That nothing can be without a sufficient reason;” and to modern philosophers we stand indebted for it. In order to give you an idea of this principle, you have only to consider, that in every thing presented to you, it may always be asked, “Why it is such?” And the answer is what they call the sufficient reason, supporting it really to correspond with the question proposed. Wherever the “why” can take place, the possibility of a satisfactory answer is taken for granted, which shall, of course, contain the sufficient reason of the thing. This is very far, however, from being a mystery of modern discovery. Men in every age have asked “why;” an incontestable proof of their conviction that every thing must have a satisfying reason of its existence. This principle, that nothing is without a cause, was very well known to ancient philosophers; but unhappily this cause is for the most part concealed from us. To little purpose do we ask “why:” no one is qualified to assign the reason. It is not a matter of doubt, that every thing has its cause; but a progress thus far hardly deserves the name; and so long as it remains concealed, we have not advanced a single step in real knowledge. You may perhaps imagine, that modern philosophers, who make such a boast of the principle of a satisfying reason, have actually discovered that of all things, and are in a condition to answer every why that can be proposed to them; which would undoubtedly be their very summit of human knowledge; but, in this respect, they are just as ignorant as their neighbors: their whole merit amounts to no more than pretension to have demonstrated, that wherever it is possible to ask the question “why,” there must be a satisfying answer to it, though concealed from us. They readily admit, that the ancients had a knowledge of this principle, but a knowledge very obscure; whereas they pretend to have placed it in its clearest light, and to have demonstrated the truth of it: and therefore it is that they know how to turn it most to their account, and that this principle puts them in a condition to prove, that bodies are composed of monads. Bodies, they say, must have their sufficient reason somewhere, but if they were divisible to infinity, such reason could not take place: and hence they conclude, with an air altogether philosophic, “that, as every thing must have its sufficient reason, it is absolutely necessary that all bodies should be composed of monads:” which was to be demonstrated. This, I must admit, is a demonstration to be resisted. It were greatly to be wished that a reasoning so slight could elucidate to us questions of this importance; but I frankly confess, I comprehend nothing of the matter. They talk of the sufficient reason of bodies, by which they mean to reply to a certain “wherefore,” which remains unexplained. But it would be proper, undoubtedly, clearly to understand, and carefully to examine a question, before a reply is attempted; in the present case, the answer is given before the question is formed. Is it asked, “Why do bodies exist?” It would be ridiculous, in my opinion, to reply, “Because they are composed of monads;” as if they contained the cause of that existence. Monads have not created bodies: and when I ask, “Why such a being exists?” I see no other reason that can be given but this, “Because the Creator has given it existence;” and as to the manner in which creation is performed, philosophers, I think, would do well honestly to acknowledge their ignorance. But they maintain, that God could not have produced bodies, without having created monads, which were necessary to form the composition of them. This manifestly supposes, that bodies are composed of monads, the point which they meant to prove by this reasoning. And you are abundantly sensible, that it is not fair reasoning to take for granted the truth of a proposition which you are bound to prove by reasoning. It is a sophism known in logic by the name of a petitio principii, or, begging the question. This is the fifth of eleven Letters of Euler I will rewrite and post on the subject of infinitesimals (the infinitely small), an idea that is fundamental to a good understanding of calculus. Click here to read the previous letter. Letter XI. Reflections on Divisibility in infinitum, and on Monads. In speaking of the divisibility of body, we must carefully distinguish what is in our power, from what is possible in itself. In the first sense, it cannot be denied, that such a division of a body as we are capable of, must be very limited. By pounding a stone we can easily reduce it to powder; and if it were possible to reckon all the little grains which form that powder, their number would undoubtedly be so great, that it would be matter of surprize, to have divided the stone into so many parts. But these very grains will be almost indivisible with respect to us, as no instrument we could employ would be able to lay hold of them. But it cannot with truth be affirmed that they are indivisible in themselves. You have only to view them with a good microscope, and each will appear itself a considerable stone, on which are distinguishable a great many points and inequalities; which demonstrates the possibility of a farther division, though we are not in a condition to execute it. For wherever we can distinguish several points in any object, it must be divisible into so many parts. We speak not, therefore, of a division practicable by our strength and skill, but of that which is possible in itself, and which the Divine Omnipotence is able to accomplish. It is in this sense, accordingly, that philosophers use the word ‘divisibility:’ so that if there were a stone so hard that no force could break it, it might be without hesitation affirmed as divisible, in its own nature, as the most brittle, of the same magnitude. And how many bodies are there on which we cannot lay any hold, and of whose divisibility we can entertain not the smallest doubt? No one doubts that the moon is a divisible body, though he is incapable of detaching the smallest particle from it: and the simple reason for its divisibility, is its being extended. Wherever we remark extension, we are under the necessity of acknowledging divisibility, so that divisibility is an inseparable property of extension. But experience likewise demonstrates that the division of bodies extends very far. I shall not insist at great length on the instance usually produced of a ducat*: the artisan can beat it out into a leaf so fine, as to cover a very large surface, and the ducat may be divided into as many parts as that surface is capable of being divided. Our own body furnishes an example much more surprizing. Only consider the delicate veins and nerves with which it is filled, and the fluids which circulate through them. The subtility there discoverable far surpasses imagination. *A ducat is a gold coin used in Euler’s day. The smallest insects, such as are scarcely visible to the naked eye, have all their members, and legs on which they walk with amazing velocity. Hence we see that each limb has its muscles composed of a great number of fibres; that they have veins, and nerves, and a fluid still much more subtile which flows through their whole extent. On viewing with a good microscope a single drop of water, it has the appearance of a sea; we see thousands of living creatures swimming in it, each of which is necessarily composed of an infinite number of muscular and nervous fibres, whose marvellous structure ought to excite our admiration. And though these creatures may perhaps be the smallest which we are capable of discovering by the help of the microsope, undoubtedly they are not the smallest which the Creator has produced. Animacules probably exist as small relatively to them, as they are relatively to us. And these after all are not yet the smallest, but may be followed by an infinity of new classes, each of which contains creatures incomparably smaller than those of the preceding class. We ought in this to acknowledge the omnipotence and infinite wisdom of the Creator, as in objects of the greatest magnitude. it appears to me, that the consideration of these minute species, each of which is followed by another inconceivably more minute, ought to make the liveliest impression on our minds, and inspire us with the most sublime ideas of the works of the Almighty, whose power knows no bounds, whether as to great objects or small. To imagine that after having divided a body into a great number of parts, we arrive, at length, at particles so small as to defy all farther division, is therefore the indication of a very contracted mind. But supposing it is possible to descend to particles so minute as to be, in their own nature, no longer divisible, as in the case of the supposed monads; before coming to this point, we shall have a particle composed of only two monads, and this particle will be of a certain magnitude or extension, otherwise it could not have been divisible into these two monads. Let us farther suppose, that this particle, as it has some extension, may be the thousandth part of an inch, or still smaller if you will; for it is of no importance, what I say of the thousandth part of an inch may be said with equal truth of every smaller part. This thousandth part of an inch, then, is composed of two monads, and consequently two monads together would be the thousandth part of an inch, and two thousand times nothing, a whole inch; the absurdity strikes at first light. The partisans of the system of monads accordingly shrink from the force of this argument, and are reduced to a terrible nonplus when asked how many monads are requisite to constitute an extension. Two, they apprehend, would appear insufficient, they therefore allow that more must be necessary. But, if two monads cannot constitute extension, as each of the two has none; neither three, nor four, nor any number whatever will produce it; and this complexity subverts the system of monads. Are your courses best for mathy children, or can average students also complete them? While “mathy” really isn’t a word, anyone with any teaching experience knows what this parent was talking about. Some students just “get” math quicker than others. They’re able to go farther and faster in math than most children their age. So, is Shormann Math mainly for these students, or is it more for students who are gifted in other, “non-mathy” areas? Everyone loves sea turtles, right? I mean, do you know anyone who hates sea turtles? I don’t. There are some things in this photo that everyone can relate to, like beauty, design, color, and function, to name a few. There are also things that individuals gifted in certain areas would appreciate that others won’t. Photographers, for example, may be curious about what type of camera was used, resolution, lighting, etc. Everyone might notice how the magnified view of the eye is blurred, and composed of rows and columns of tiny squares. But only someone with a good knowledge of computers and/or digital photography could explain the “why” behind the tiny squares (called pixels). But what if your child is a future computer scientist, engineer, etc., and they just don’t know it yet? What if they, or you, haven’t already drawn the line between “mathy” and “non-mathy?” Well, Shormann Math is for you, too! Because everyone is created in God’s image (Genesis 1:26-28), everyone is designed to be creative like Him, too. But while God can just create by speaking (John 1:1-5), we humans need tools. And mathematics is like a giant treasure chest of tools, waiting to be discovered and put to use. But the primary focus of Shormann Math is not about math. It’s about relationship. It’s about using math to help a child discover more about God’s Word and His creation, and build their relationship with Christ. If you study the greatest mathematicians in history, like we do in Shormann Math, you find that all their new mathematical discoveries were connected to their study of Creation. While not all of them acknowledged God, a lot of them did, and in doing so it allowed them to see farther and discover more than any of their predecessors. The rich Christian heritage of modern mathematics is not something to hide in the back of a dark closet, but, like a favorite painting, it should be placed in the right frame, with the right lighting, and set in a prominent place. Shormann Math is designed to connect students to their world and their Creator by using an incremental approach with continual review to teach 10 major math concepts from a Christian foundation. But does this “incremental approach with continual review” work? Well, the results of our Shormann Algebra 1 beta-test say “yes!” Pioneered by the late John Saxon (1923-1996), his “incremental approach with continual review” has achieved astounding results. The results of Saxon Math in a traditionally low-performing Dallas public school were highlighted in this 1990 interview on 60 Minutes. Even a former U.S. President saw the merits of a teaching method that could help the average student go farther in mathematics than they ever dreamed. Scholars describe mathematics as “the language of science.” And what is a good way to learn a new language (or a sport, or an instrument)? Well, you learn some of the basics, practice for a while, and then learn some more. You use an “incremental approach with continual review!” And like a language, sport, or instrument, mathematics is not a passive, textbook-only activity. It’s an active, pencil and paper pursuit. The method is instrumental in making Shormann Math for everyone! Click here if you want to learn more about Shormann Math, including pricing, sample lectures and homework, a detailed teacher’s guide, and more. One of the primary reasons John Saxon developed his math curriculum in the 1980s was because new ways of teaching math were not working. Math “educrats” at the time were promoting their untested “visions” of math teaching. But with 3 engineering degrees, John was a math user before he became a math teacher. Not only that, he was a test pilot. If anyone knew the extreme value and importance of testing a new product, it was John! Results matter because they reveal whether or not a new product really works. And while statistics certainly don’t reveal everything about a new product, they can certainly reveal many things. Most math curricula don’t provide this level of detail on student performance. But with Shormann Math, each new course is beta-tested in a live, online setting first before releasing it to the general public. The following are statistics from the beta-test of Shormann Algebra 1. The results show that the majority of students made an A! The following statistics, plus other detailed information about the course, can also be found in our Shormann Algebra 1 teacher’s guide. To purchase Shormann Math, click here. Discussion: The average student in our beta test made an A in the class! Because each new Shormann Math course is beta-tested in a live online class setting, Dr. Shormann gets to know the students on more than just a “numbers only” basis. And we all know that God doesn’t make clones, so the fact that not every student performed the same should not be a surprise. Natural talent definitely matters, but so do things like attitude and maturity. Dr. Shormann spends time during the video lectures encouraging students to develop fruits like patience and self-control (Galatians 5:22-23), as well as persevering with joy (James 1:2-3), and gratefulness (I Thessalonians 5:18). Discussion: You’ve probably never seen statistics on student performance in a math class before, which is why it is important to discuss the data! The decreasing trend over time is exactly what we expected. Two big factors are responsible for the trend: 1) There’s more review of previously-learned concepts at the beginning, so it’s easier and 2) student effort tends to decrease the closer you get to the end of the year! What we had hoped for was a Practice Set average above 85%, and that was achieved in all 4 quarters! 85% is a good cutoff for determining whether students are understanding, and retaining most of the concepts learned. Note also the high first quarter average. Because Shormann Math is built on John Saxon’s method of integrating geometry and algebra, students using Saxon Math 8/7 or Saxon Algebra ½ will be most comfortable starting Shormann Math. However, not all beta-test students used Saxon previously, so the high first quarter average is a good indication that students who successfully completed any pre-algebra course should do just fine in Shormann Math. Discussion: Weekly Quizzes show a similar trend to the Practice Sets, challenging the students more as the year progressed. A score of 8 out of 10 or higher is a good indication of whether students understood the lessons covered that week. We are pleased that scores were well above this in all four quarters! Discussion: Notice the Quarterly Exams do not follow the same trend as Practice Sets or Weekly Quizzes, with Quarter 1 having the lowest average. And this is where beta-testing a new product is so valuable. We realized that we were asking a lot for 9th-grade level students, most of which had never taken a cumulative exam like this. The solution? Practice exams! Just like when learning a sport, a musical instrument, etc., good practice results in good performance. The beta-test students clearly performed best on first quarter Practice Sets and Quizzes. Most likely, if they were given practice exams prior to their quarterly exam 1, this would have been their highest exam average. Now, all quarterly exams have two practice exams that students use to study for their actual exam. 85%+ is an indicator of good retention and understanding of concepts covered in a quarter. For all 4 quarters, student averages were at, or well above 85%. 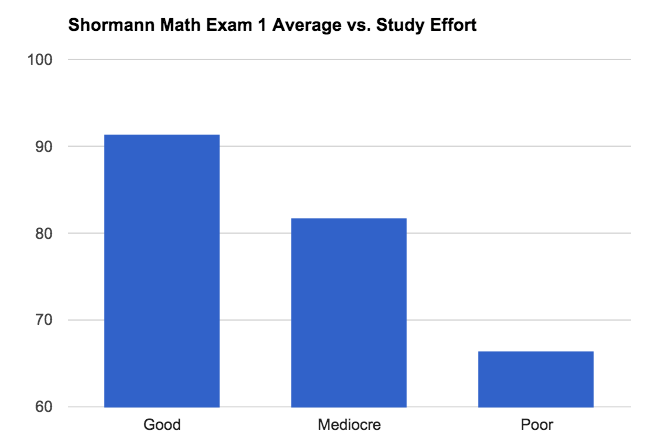 Because of Shormann Math’s format of continual review, we are basically asking students to be responsible for “all their math, all the time.” These results show that on average, students are responding very well!